UP TO 20% OFF - Use Code Java247 to save at checkout! 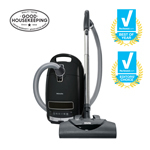 The Miele Complete C3 Kona canister vacuum cleaner combines the innovative and practical features of the Miele C3 series with the powerful SEB228 motorized carpet nozzle for homes with thicker pile carpet and pet hair. Like all Miele Complete C3 canisters, the Kona lightens your load using Miele's new skeletal body that provides all the strength of a solid-body vacuum with only half the weight. Rubber bumper protectors, tap-control suction adjustment and on-board tools round out the convenience features that make this Miele canister a great all purpose vacuum for any home. Warranty: 7-year suction motor; 7-year casing; 1-year all non-wearing components.